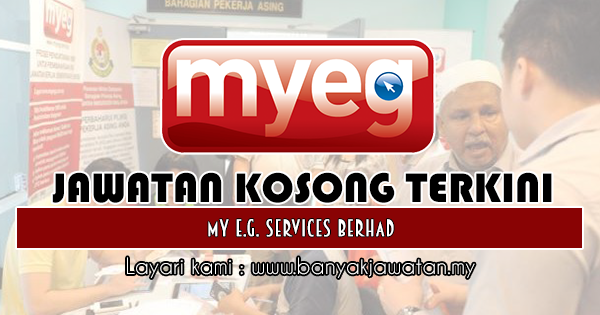 MY E.G SERVICES BERHAD is an MSC status company and listed on the Main Board of Bursa Malaysia Securities Berhad. We are engaged in the development and implementation of Electronic Government services, one of the flagship applications under the MSC project initiated by the Government of Malaysia. We provide services related to government agencies such as Jabatan Pengangkutan Jalan, Polis DiRaja Malaysia, Jabatan Insolvensi Malaysia, Dewan Bandaraya Kuala Lumpur, Jabatan Pendaftaran Negara, Immigration Department, Tenaga Nasional Berhad and Telekom Malaysia Berhad. 0 Response to "Jawatan Kosong di MY E.G. Services Berhad - 15 April 2019"